One of the best ever Heavy Metal album that I really like to listen in my teenage days was the so-called "Them" by the heavy metal group King Diamond. Although the lyrics sometime consist with bad word but the music style that this band bring really impress me much. Beside King Diamond, I like to listen to Metallica, Iron Maiden, Megadeath, AC-DC, Black Sabbath, Slayer and Testament. 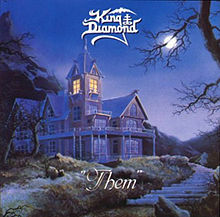 "Them" is an album by King Diamond released in 1988 on Roadrunner Records. It is the first of two fictional concept albums about King and his mentally ill grandmother, the second of these being Conspiracy. King falls into a harrowing descent into madness via his grandmother and the voices in the House of Amon, known to the listener only as "Them". This album has sold over 200,000 copies in North America alone. As the album opens, a young King and his mother and sister are welcoming King's grandmother home from a mental asylum. That night, King investigates strange voices and discovers his grandmother having a tea party alone, with the teacups and kettles floating in the air. King is promptly sent back to bed. On another occasion, Grandma awakens King and tells him that she will teach him about Amon, their house, over a cup of tea. Grandma cuts King's sleeping mother's hand and adds her blood to the teapot. The voices of the house ("Them") begin to affect King with a drug-like effect. King's sister Missy tries to convince King that they should do something to help their mother, who is unconscious under "their" power, but his judgment is clouded due to his altered state. He refuses to call for help and cuts the phone line. At tea, Missy interrupts and furiously expresses concern about her mother's state and breaks the teapot. "They", in response to the breaking of "their" teapot, chop Missy into bits with an axe and throw the remains into the fireplace in the kitchen. King is snapped out of his "spell," and he stumbles outside and pieces together the events that transpired. After fainting and regaining consciousness, he decides to attack his grandmother. 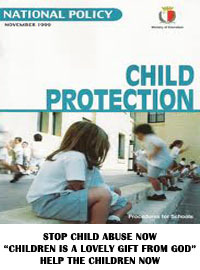 He notices that "their" power is weakened outside of the house, so he lures his grandmother outside and kills her. The voices of Amon continue to haunt the boy as he is questioned by police and incarcerated in an asylum. Years later, he is released and returns home to find his grandmother and the voices of Amon are still very much alive.